Editor's Note: Ms. Howard is Unit William and Mary's Unit Leader. She has been an AUP member since February 2015. In that time, she has reached AUP Senior Status, received her Telecommunications Operator and ATON verifier qualifications, and completed an internship at Coast Guard Headquarters. Ms. Howard serves on the S-Directorate national staff as an Innovation Branch Assistant and on the D-Directorate national staff as a Diversity Branch Chief. She is expected to graduate from William and Mary in 2018. This winter break, I was privileged to spend 26 days aboard the USCGC Hollyhock, homeported in Port Huron, Michigan. She is a 225-foot buoy tender and icebreaker, commanded by Lieutenant Commander Molly K. Waters. I didn’t know what to expect when I came on board, but I was ready to experience cutter life. There is so much energy and activity aboard a ship; the first few days were pretty overwhelming! My first task was to do a system drawing of the firemain, a complex maze of piping that delivers seawater with which to fight fires. The firemain winds throughout the entire ship, in every space. Following it was certainly an intimate way to get acquainted with the ship and learn my way around, including the occasional head bump. Firemain conquered, I spent my free time learning about basic damage control, important skills in case anything goes wrong on the ship. Hull breaches and fires are the first things that come to mind when I think of “damage control” on a ship, but first aid is also part of basic damage control. I spent two days with the ship’s health service technician learning first aid principles, practicing on fake wounds and injuries. My main goal onboard was to become qualified as an Inport Security Watchstander (ISW). Every day, there are three ISWs who make up the duty section, along with the Officer of the Day (OOD) and the Engineer on Watch (EOW). The ISWs each have two four-hour watches, where they go on a round of the ship, checking all of the important spaces for any issues. They then remain on the bridge for four hours, manning the phones, computer systems, and responding in case of emergency. The ISW qualification is a comprehensive packet of sign-offs for which the member must demonstrate proficiency. Basic Damage Control is a prerequisite, and ISW is earned after completing the sign-offs and then sitting before an oral board, which is much more nerve-wracking than a written exam! Luckily, the crew was always willing to sit down with me and go over information and sign-offs, so I was able to learn the material and pass my board during my time on the Hollyhock. On my penultimate day, I stood my first watch. Nothing dangerous or exciting happened, but I was satisfied in the knowledge that I was properly educated and equipped to handle any situation that could have arisen. Auxiliarist Howard shoveling snow off the buoy deck. The best part of my time aboard the black hull was the camaraderie and teamwork. The crew was welcoming and kind. I felt at home my first day, and it was difficult to leave at the end of my short tour. The crew itself is as integral a system to any ship as are the hull and machinery spaces, and gives the ship the breath of life and of spirit that makes it into a unit. January brought to Michigan some bitterly cold weather, including a good snow. One of the best mornings was when a whole group of us trooped out into the snow and shoveled the buoy deck and parking lot for hours, with the occasional flying snowball. I firmly believe that the Coast Guard has some of the best missions and service members in our armed forces. Even in adverse situations and conditions, the morale and companionship of the crew never wavered. I am immensely grateful to the crew and the commander of the USCGC Hollyhock for allowing me to spend my winter break with them. 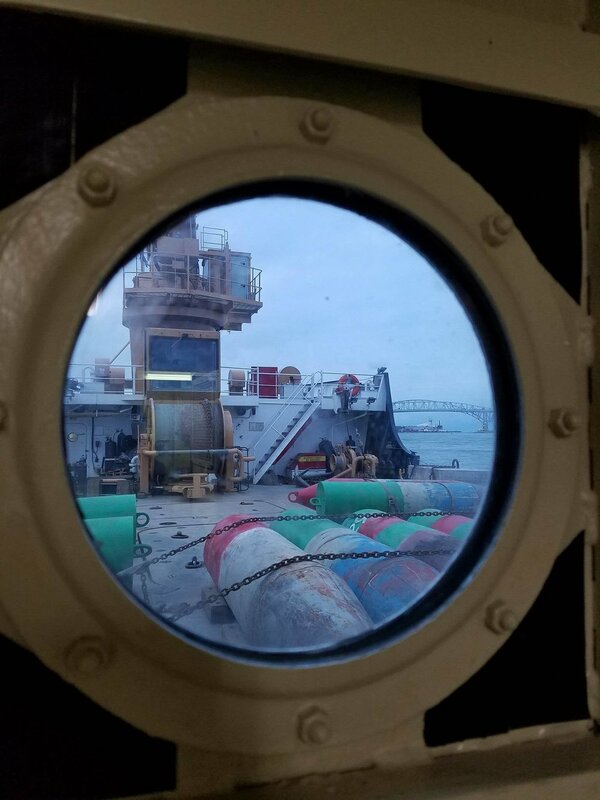 Being on a USCG cutter is an experience I will never forget, and one that I highly recommend to anyone who wants to learn a lot, work hard, and enjoy themselves immensely. Winter marks tied down to the buoy deck. Underway view of ice on Lake St. Clair. Deck crew brings in the last buoy of the season.